As someone who’s spent many years at the university, who loves Shakespeare and is also an aspiring writer, I have always had a special affection for movies about writing, about authors, about theatre and about teaching. I recently watched, for instance, Tenure (2008) and Liberal Arts (2012), both of which I was however a bit disappointed by, and more recently I have seen Tamara Drewe (2010) and The English Teacher, both of which I found really underrated. The English Teacher is a funny and feel-good movie, although for some of the time it pretends not to be. 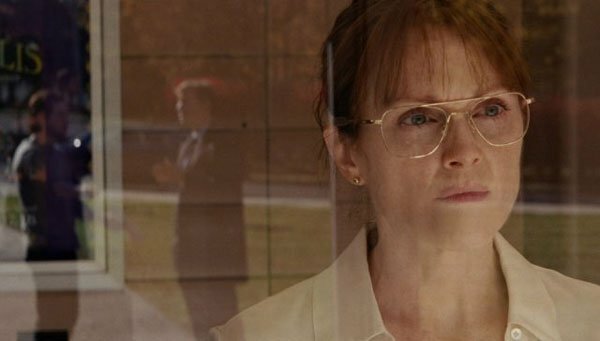 It starts out with a sort of spinster tone narration, explaining about the bookish life of 45-year-old high school English teacher Linda Sinclair (Julianne Moore). She has long since stopped dating because the romantic literature she has always been embedded in has made her standards concerning men altogether too high, and when she did date she kept grading the men on their initial impressions, never finding anyone who, well, made the grade. Linda’s neat but slightly sad life is interrupted when one of her former students, Jason (Michael Angarano), returns to her small town of Kingston, Pennsylvania, having written a good play, but failed to have it staged in New York. He is convinced he’s a failure and is dejectedly set to follow his dad’s advice about going to law school. Reading his play and loving it, Linda makes it her mission in life to bring Jason back on track and make him pursue his true calling as a writer, and to this end she arranges for her high school drama club to stage his play. This, for many reasons, opens up a massive can of worms and Linda’s life spins out of control and into turmoil. It is, as always, a pleasure to watch Julianne Moore, who (at the making of this movie) is a 52-year-old that almost looks younger than the 45 she is supposed to be here. Another significant part is enacted by Lily Collins, who once again quite convincingly plays a high school student. Craig Zisk, the director, has previously directed such things as episodes of Weeds, which is one of my favourite shows from the last several years. He is clearly an experienced guy who knows what he is doing. Some of the other reviews of this movie have been rather lukewarm. In my view, however, the movie is thoroughly charming and effective all the way through, fully capturing and keeping your attention, and any points of criticism that might occur to me are very tiny indeed. All the characters and situations work very well, and the result is simply lovely. The DVD screener reviewed here also contains no less than 82 minutes of interviews with the cast and crew, in which we learn, among other things, that this is a rather low-budget indie movie (that the name actors are doing for very little pay). This, perhaps, also explains the rather poor technical quality of the interviews, with questions being inaudible, being interrupted, being repeated several times, and the camera indescriminately zooming in and out. But this is no great problem; the interview with the husband-wife writer team especially is very casual and enjoyable. The English Teacher is released on DVD in the UK on March 3. Cast: Julianne Moore, Michael Angarano, Greg Kinnear, Lily Collins, Nathan Lane, Fiona Shaw (narrator), Jessica Hecht, Nikki Blonsky and others.